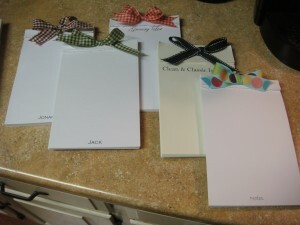 Along with some of my other mom friends, we went to a local printing company and custom ordered our notepads. Because of ordering in bulk, they were able to give us a great price. 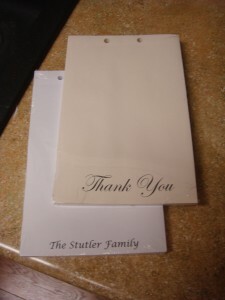 We supplied the paper - they cut, printed, hole punched and perforated them. Then we got to do the fun stuff — adding ribbon. And if you want proof that I really thought up all of these — here is my proof. 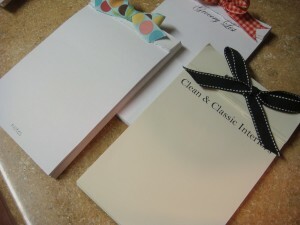 Yes, I do love notepads! Are your wheels turning? What would you use one for? Would you believe me if I told you that I have a hard time using my notepads because I don’t want to run out of them? I didn’t think so. I made one for each boy and they think it is great to write their thank you notes and such on paper with their names on them. Such a treat for them at a fraction of the price if I had bought them in a boutique! So glad we did them.